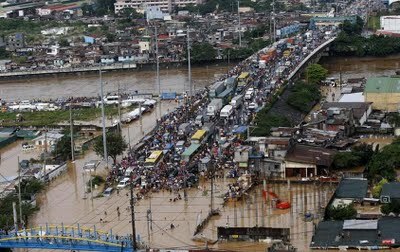 Tropical storm Ketsana (locally named 'Ondoy') dropped a months worth of rain fell on Manila in a matter of six hours on Saturday. According to CNN, there are at least 140 people dead, many still missing, 300,000 displaced and I suspect many more will be victims of the aftermath. My parents moved back to Manila in the mid-90s – they are (thankfully) safe. 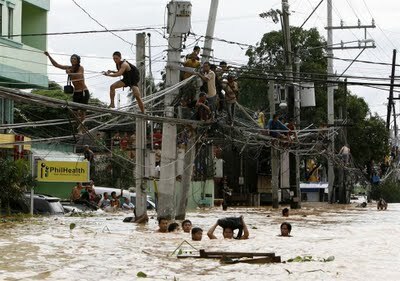 My father told me the water in some areas rose to five meters in a matter of an hour. People did not even have time to move. They didn't stand a chance. Why do the poorest places in the world always the ones to get hit with the worst natural disasters? For those who may not know, I am ethnically Filipino. I was born in Manila and still know how to speak the language. We moved to California when I was 11 going on 12 years old. I still remember what typhoon season can be like. But this is worse than anything I could ever imagine, maybe the worst yet. It's a country where 80% of the population already live below the poverty line – many in flimsy shanty towns which are somehow 'invisible' to the rich. On Sunday, 80% of the city was under water. Seeing these images really breaks my heart. I wish I could do more to help. It makes me realize how fortunate I am, that I complain about things I don't have any right to complain about. 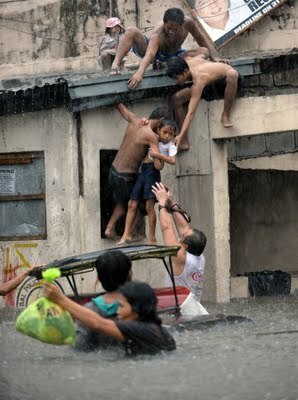 Please make a donation, if you can, to help the victims of the Ondoy Flood in Manila.